Financial services group CBZ Holdings and Bulawayo City Council (BCC) yesterday signed a memorandum of understanding (MOU) to construct 670 houses at a cost of $7 million in the city. BCC acting mayor, Norman Hlabani, said the signing of the MOU would pave way for the implementation of the Mahatshula East housing project with 670 medium density stands measuring 600 square metres each. “This housing project will avail stands that have been serviced with water, sewer and tarred roads. The preliminary designs of the servicing are estimated to have 14 000 metres of sewer, 12 500 metres of water and 15 500 metres of roads,” Hlabani said. He said the project will be implemented through a special purpose vehicle (SPV) that will provide both BCC and CBZ with a shareholding on the basis of contribution towards the project. “This will form equity contribution into the project. The operations and daily management of the SPV shall be through a specially constituted project team with personnel drawn from Bulawayo City Council and CBZ,” he said. He said BCC remained committed to reducing the city’s housing backlog. Bulawayo’s housing waiting list is currently at 110 000. CBZ divisional director-mortgage finance, Casper Chibanga said that the project would start before year-end and be completed in 2018. 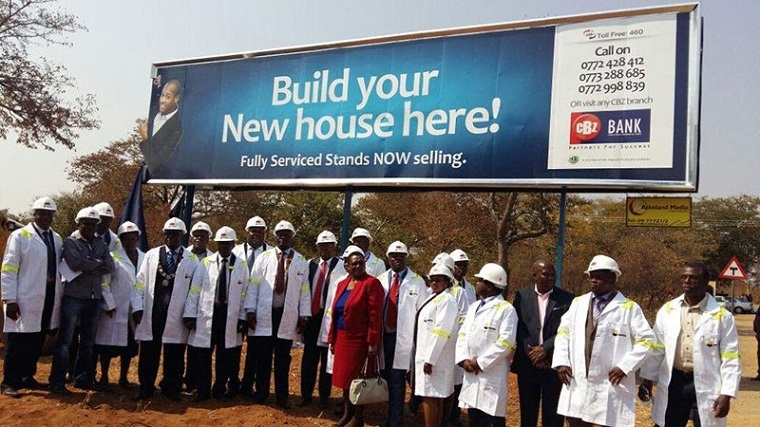 CBZ recently commissioned more than 1 300 fully serviced residential stands in Victoria Falls.